The purpose of this study is to determine the performance implications of rebalancing a cryptocurrency portfolio. Specifically, the focus will be placed on the crypto bear market which began in January 2018. In order to conduct a study that fairly evaluates returns from rebalancing a portfolio, we need to carefully think about our backtest, data, and variable inputs. Complete order book data was collected from Bittrex exchange. Bittrex data was provided by CoinAPI. Using their rest APIs, we were able to compile the 20 best bid and ask prices available on Bittrex at each rebalance interval. Our data set ranges from January 7th, 2018 until January 24th 2019, and actual order book data was used for this study. All trades assumed the standard 0.25% trading fee on Bittrex. For a detailed analysis of the effect of trading fees, please refer to the article below. We will simplify the trading logic for this study by restricting buys and sells to BTC pairs. Therefore, a trade from ETH to USDT would trade from ETH to BTC and then BTC to USDT. Even though there is an ETH to USDT trading pair on Bittrex, for the sake of this study, we will ignore these alternate trading pairs. In this case, both of these trades will incur a 0.25% fee. We will be evaluating a wide variety of diverse portfolios, starting from just 2 assets and going up to 18 assets, with intervals every 4 assets. This sample size range should cover a majority of cryptoassets. Within Shrimpy’s user base, around 68% of users manage portfolios ranging between 2 to 18 assets. For more information about portfolio diversification and the optimal portfolio size, please visit our article below. Next, we need to set some rebalancing event parameters to backtest our portfolios. The rebalance period determines the time interval between rebalancing events. For instance, a rebalance period of 1 week means that a portfolio rebalances on a weekly basis. A portfolio with a 1 day rebalance period would rebalance daily. In this study, we will explore 1 hour, 1 day, 1 week, and 1 month rebalance periods. We hypothesize that by changing the rebalance period, our portfolios will experience drastic variations in regards to their performance. Learn more about portfolio rebalancing for cryptocurrency. In order to reduce selection bias during the backtesting process, our study randomly selects assets to include in each portfolio. The process begins by constructing a list of every available asset on Bittrex from January 7th, 2018 through January 24th, 2019. A script then randomly selects a mix of assets from the list to construct each portfolio. Each asset in the portfolio is assigned an equal percent weight of the total value. The total portfolio value at the start of each backtest is $5,000. Backtesting is the process of simulating the trading of a strategy over time by using the trade data on an exchange. The purpose of backtesting is to examine the viability of a strategy through stress testing the results across large data sets. Our study will use backtest different rebalancing strategies and compare returns to an identical HODL (buy-and-hold) portfolio. To prevent outliers from skewing our results, we ran over 1000 backtests for each rebalance period and portfolio size pair. The results were collected, then the values were plotted in a histogram. We will also provide the median performance across the collective results to provide a simple metric that represents the cumulative performance. Read more about backtests or run your own. The study begins with a 2-asset portfolio. This is the smallest portfolio size we will evaluate. The result of a 2-asset portfolio is essentially the movement of value back and forth between the two different assets. The results indicate 2-asset portfolios vary widely in performance. This should be expected as the probability of randomly selecting 2 assets that result in exceptionally strong or weak performance is relatively high. We would expect that as we increase the number of assets in the portfolio, the variety of assets that will be included in each portfolio will help stabilize the portfolios and drive them to converge on a smaller range of performances. At a quick glance, we notice the 1 day rebalance period has outperformed other rebalance periods for these 2-asset portfolios. This is likely due to the high trading fee that is incurred on Bittrex for every trade that is executed. While we don’t include this data within this study, what we would expect is that as the trading fee is reduced, the hourly rebalance period would begin to outperform the daily rebalance period. You can learn more about how this works in one of our previous research articles here. 2-asset portfolios utilizing a daily rebalancing period outperformed identical buy-and-hold portfolios by an average of 12.2%. Continuing into 6-asset portfolios, we observe that our expectations appear to be correct. Increasing the number of assets in the portfolio from 2 to 6 resulted in a tightening of the performance range for each of these evaluated rebalance periods. However, there is still a nearly 100% performance range for each of these rebalance periods. As the number of assets in each portfolio continues to increase, we should evaluate how this range changes. 6-asset portfolios utilizing a daily rebalancing period outperformed identical buy-and-hold portfolios by an average of 21.6%. 10-asset portfolios continue the trends observed in 2 and 6-asset portfolios. The performance range for each of the rebalance periods begins to squeeze to approximately 80% from the lowest to highest performing portfolios. In addition, we continue to see a climb in the median performance for the daily, hourly, and weekly periods. Oddly, we see a decline in the median performance for the monthly rebalance period when compared to the 6-asset portfolios. The 10-asset portfolio marks the first portfolio size where the hourly rebalance period outperforms the monthly period. 10-asset portfolios utilizing a daily rebalancing period outperformed identical buy-and-hold portfolios by an average of 22.7%. The trend of observing increased performance as we increase the portfolio size continues for the 1 hour, 1 day, and 1 week rebalance periods. The 1 month rebalance period continues to decline in performance when compared to the 6 and 10-asset portfolios. Additionally, we observe the range of performances for the 14-asset portfolios continues to converge towards a smaller range of results. We can now see a performance spread between 60–70% across all rebalance periods that were evaluated. 14-asset portfolios utilizing a 1 day rebalance period outperform buy and hold by 23.5%. The final portfolio size we will examine is the 18-asset portfolio. 18-asset portfolios continue the trends we observed in the 10 and 14-asset portfolios. The performance range continues to decrease to around 50% across the rebalance. In addition to this trend, we can find a few other trends throughout all the results we have examined so far. One of these trends is that as we increase the rebalance period, the distribution of performance results generally becomes narrower. So, not only does the number of assets in the portfolio have a role in determining what sort of distribution we should expect, but so does the rebalance period. 18-asset portfolios utilizing a daily rebalancing period outperformed identical buy-and-hold portfolios by an average of 24.9%. Once we aggregate all the data, we can construct a simple 4 x 5 grid that illustrates the performance across all rebalance periods and portfolio sizes. When we consider the median value for the resulting performance distribution, what this represents is the mid-point for performance. This means you can consider it the point at which half of the portfolios performed better than this number and half of the portfolios performed worse. Additionally, each of the values that are included in this chart are the percent gain over buy and hold. A value of 10% is therefore representing a performance 10% BETTER than buy and hold. This chart illustrates a few different trends from which we can draw conclusions. The first trend we can clearly see is the portfolios which hold more assets perform better. The only rebalance period which does not fit this trend is the 1 month rebalance period. The second trend we observe is that more frequent rebalance periods tend to outperform longer rebalance periods. In this study, the exception to that rule was the 1 hour rebalance period. Due to the higher fees on an exchange like Bittrex, high frequency rebalancing resulted in a reduction in portfolio performance. To provide a visualization of every backtest that was run, we can combine every backtest into a single histogram. Once these backtests have been combined into a single chart, we can get a complete understanding of how rebalancing compares to buy and hold over all tested rebalance periods and portfolio sizes. Across all backtests, we observe a median performance increase of 11.46%. 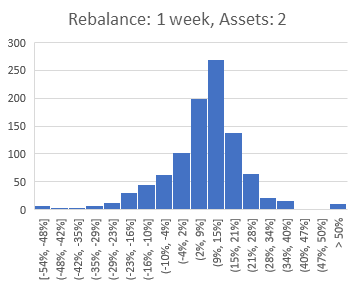 This means, if we randomly selected a portfolio size between 2 and 18, randomly selected a rebalance period between 1 hour and 1 month, and randomly selected the assets in the portfolio, there would be a 50% chance that rebalancing that portfolio would result in a performance increase of at least 11.46% when compared to buy and hold. In total, 78.67% of portfolios which rebalanced outperformed buy and hold during the 2018 bear market. Based on these results, we can extract two major conclusions. First, increasing the number of assets in a rebalanced portfolio tends to increase portfolio performance. Increasing the amount of assets in a portfolio tends to improve overall performance as it increases risk exposure to that respective asset class. With more risk exposure, we can also expect improved returns. Second, decreasing the rebalance period tends to increase portfolio performance. While there are exceptions for high-frequency rebalancing periods due to the impact of trading fees, this generally holds true as we reduce the rebalance periods. Reducing the rebalance period is just an alternative method of reducing a portfolio’s risk exposure by automatically moving gains from outperforming assets into under performing assets. The strategy of implementing a diverse crypto index portfolio with an automated rebalancing strategy is a fine balancing act of selecting a diverse number of assets with a corresponding portfolio rebalancing strategy. This study supports the overwhelming evidence that portfolio rebalancing provides measurable value to cryptocurrency portfolios even during a bear market. While the cryptocurrency market is still emerging, it’s important to consider traditional portfolio strategies which have already demonstrated their immense capacity to stabilize and grow portfolios. Shrimpy is a free application which automatically rebalances your portfolio. Our dedicated tools for asset allocation, backtesting, and indexing the market are the most powerful in the industry. Whether you are an institution or individual, our solutions are designed to solve the most pressing problems facing portfolio management in the crypto space. Integrate the Shrimpy Universal Crypto Exchange APIs into your application today to get instant access to trade execution, portfolio rebalancing, market data, user API key management, and much more across every exchange we support. It’s the quickest way to make your users happy and accelerate the development of your crypto app. $300 Million in Trades: The Crypto App doing 2% of Bitcoin’s Trade Volume?